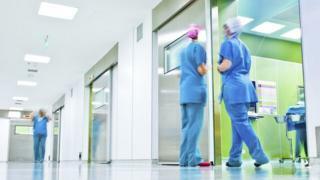 Cutting back on hospital services in England - before community services are geared up to provide care - is a "recipe for disaster", MPs say. The Health Select Committee said the NHS faced "one of its greatest challenges" dealing with patients with long-term conditions, such as diabetes. They account for 70% of health spending but only 30% of patients. The NHS has tried to ensure more care is done in the community, but the MPs questioned the wisdom of this strategy. The cross-party group said these patients would still need specialist hospital care. The MPs acknowledged doing more in the community was perhaps desirable for the patient, but added it would not necessarily save the NHS money - as has been widely assumed. They said it was already clear there were gaps that needed to be plugged in the community, pointing to figures that showed there was a shortfall in GPs in training. But they said the NHS could not simply cut back on hospital care to pay for this. Instead, the MPs said there needed to be greater understanding of what drove patients with long-term conditions to hospital on such a scale. Figures show these patients are responsible for two-thirds of outpatient and A&E visits and occupy 77% of beds. The committee's report said evidence presented to them suggested that by 2016 the NHS would need to be finding an extra £4bn a year to cope with the rising burden of treating people with these incurable conditions unless a more efficient way of working were found. Dr Sarah Wollaston, who has just replaced Stephen Dorrell as chairman of the committee, said: "Unless we get the treatment of long-term conditions right, we are going to see more and more people unable to see a doctor in their GP surgery and therefore turning up at casualty." She added that the answer lay in making sure community services and social care were working together to keep people living independently. The government has already set out plans to achieve this through its £3.8bn Better Care Fund, which will be launched next year to encourage collaboration between the NHS and local councils. But that involves £2bn being taken from the NHS, which hospital leaders have warned is likely to hit their services hardest. Bridget Turner, of Diabetes UK, said the NHS had to develop a "clear plan". She said: "The health system needs to change to put people with long-term conditions, including diabetes, at the centre of the care they receive." But Dr Martin McShane, NHS England's director of long-term conditions, said a number of steps were already being taken to "refocus the agenda" on proactive care to keep people well and save the NHS money. He cited the push to improve the co-ordination of care for the frailest patients, which includes a new responsibility on GPs to take charge of their care. Dr McShane added: "We do not underestimate the scale of the task." Rob Webster, chief executive of the NHS Confederation, which represents NHS trusts, told BBC Breakfast that the report proved the "needs of a patient in the 21st century have changed". He said patients with long-term conditions were still being cared for with "one-off interventions" by the NHS, which he said needed to "fundamentally change the way it looks after people". "We need to see the people with long-term conditions as part of the team with the carers, the people who work in the general practices, community service providers and to join the services up around them, and that will take some time and some effort," he said.